Banning Cell Phone Use by Commercial Truck Operators – Sound Policy or Over-Reaction? Many companies in the trucking industry are debating whether to implement an outright ban of cellphone use by their truck operators while they are behind the wheel driving on busy roads and highways. What spurred this discussion? The liability exposure of trucking companies that have lax cell phone policies for their drivers. A prime example is a personal injury lawsuit filed against Unifi Inc., a polyester and nylon yarn manufacturer. A couple was allegedly injured when a Unifi truck collided with their vehicle from behind. The commercial truck driver was reportedly talking on his cell phone at the time of the collision. Unifi had a policy in place that limited drivers to using their cell phones for no longer than two minutes. Evidence surfaced showing that the company did not enforce this policy. Unifi agreed to settle the case for $3.75 million and agreed to institute a ban on its drivers from using cell phone devices while their trucks are operational on roads and highways, according to The Post and Courier. Taking necessary safety precautions when operating a vehicle is important and reducing distractions is a great goal. However, we do not live in a world free of distractions. And in Texas, there is no law prohibiting the use of a smart phone device while driving, as of the date of this posting. The Texas legislature is debating whether or not to pass a law prohibiting texting and driving, but it has not passed both legislative chambers or been sent to Governor Abbott for signing, according to govtech.com. 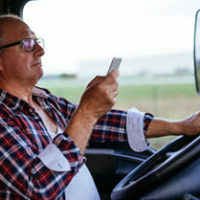 Even though Texas does not prohibit texting and driving, operators of commercial vehicles need to be more cognizant of regulations under the Federal Motor Carrier Safety Administration (FMCSA). The FMCSA banned the use of hand-held cell phones by drivers. However, they allow an exception for hands-free phones. This means a commercial truck driver using a hands-free cell phone device while driving is in compliance with federal law and is operating the tractor-trailer within the standard of care applicable to commercial vehicle operators. Your company may be considering a ban on cellphone use by your drivers. You have every right to adopt a more stringent policy, but remember, allowing an operator to use a hands-free device does not mean that the company, or the driver, was necessarily negligent if an accident occurs while the driver was using the device. Nevertheless, whichever policy you adopt, make sure you enforce it. The Unifi settlement detailed above was likely based more on the lax treatment of the two-minute policy the company had in place than the driver actually using a hands-free device. The law firm of Colvin, Chaney, Saenz & Rodriguez, L.L.P. is comprised of experienced Brownsville trucking industry defense attorneys. We are ready to represent insurance companies and their insureds in an array of truck accident injury cases.